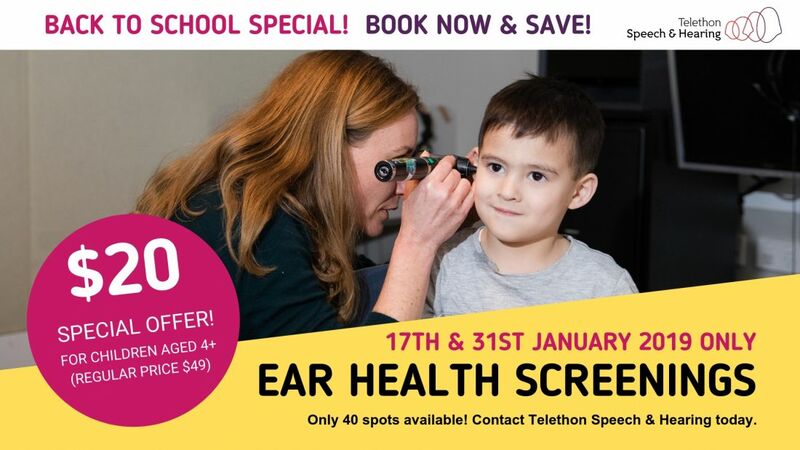 Get a quick ear health screen by a qualified audiologist before heading back to school! Have you noticed a change in your child’s attention, speech, academic performance or behaviour? Parents might not consider ear health in the first instance with some of these behaviours, particularly in regard to ignoring instructions, becoming withdrawn or not progressing with speech. But poor ear health can result in pain, poor hearing and fluctuating hearing levels in children. This can then impact attention, academic performance, as well as cause irritability and poor speech (TSH Head of Hearing Services, Philippa Hatch sits down with PerthNow to discuss more here). Do you worry about your child’s hearing or how healthy their ears really are? An ear health screening* can help. Telethon Speech & Hearing is offering a special rate for hearing screenings at our Cockburn Clinic. Ear health screenings will cost just $20 (regular price $49). Bookings are essential. Only one day remains for bookings. Book now and save by calling (08) 9387 9888 or emailing speech@tsh.org.au. Please note this special is for children aged four (4) and older. To make a booking please call (08) 9387 9888 or email speech@tsh.org.au. *Whilst not a full hearing test, a quick ear health screening will help to decide if a full hearing assessment is warranted for your child. A hearing screening is a simple pass-fail evaluation, often performed outside a hearing clinic. A variety of tools may be used, from a tablet with headphones to a portable audiometer or even a questionnaire. The person who conducts the screening will be a qualified hearing professional. He or she will be able to tell you whether a full hearing assessment is recommended, in which case you will be offered a hearing test in a clinic. A hearing test is a more comprehensive assessment that occurs in a hearing clinic. A hearing professional will ask some questions about situations in your life where you may be noticing that communication isn’t where you’d like it to be, look inside your ears, perform a test in a sound booth and explain the results to you. If you have treatable hearing loss, you will be offered a pair of hearing aids to take home and trial in your daily life.